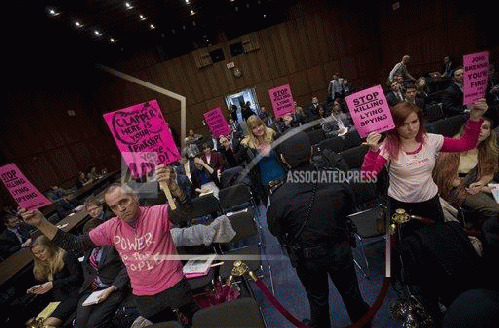 Before the hearing began, activists from CODEPINK stood up holding signs reading "Stop -- Killing, Lying, Spying' and called for the firing of James Clapper, Director of Central Intelligence, John Brennan, Director of the CIA, and James Comey, Director of the FBI. A number of senators, including Barbara Mikulski (D -- MD), and Susan Collins (R -- ME), participated in slamming Snowden. They claimed Snowden has done "great damage" in the words of Collins. Although Mikulski and Collins were beyond certain of the "damage" Snowden has caused, they seem unsure of what his first name is; Mikulski called him "Eric," while Collins referred to him as "Edwin." Senator Martin Heinrich (D -- NM) started a shift in criticism from Edward to John Brennan, Director of the CIA. "I just want to publicly note my continued disappointment of how the CIA under your leadership has chosen to engage and interact with this committee especially as it relates to the committee's study of the CIA's detention and interrogation program." Heinrich pointed to previous "inaccurate public statements," and attempts to "thwart public oversight." He then called for the committee to declassify the 6,300-word study so "the public may judge for themselves." Senator Wyden (D -- OR) continued nailing the intelligence chiefs. "The men and women of America's intelligence agencies"deserve to have leadership that is trusted by the American people. That trust has been seriously undermined by senior officials' reckless reliance on secret interpretations of the law"[and] years of misleading and deceptive statements the senior officials made to the American people" [which] hid bad policy choices and violations of the liberties of the American people." He then listed a number of occasions when officials had recently publicly lied about data collection. Last year, Clapper lied to Wyden when he asked whether intelligence agencies were collecting data on Americans. Wyden also requested direct answers to questions he has asked repeatedly without answers, such as whether Section 702 of the Foreign Intelligence Service Act has been used to conduct warrantless searches on U.S. citizens. He demanded Clapper give him an answer within 30 days. Obama has recently called for reforms to the NSA, but how can the American people have any faith given the track record of the current intelligence chiefs? As Wyden has pointed out, they have repeatedly lied, yet despite being caught red-handed, they are still in office. Perhaps Obama's reforms should also call for the resignation of these liars, echoing CODEPINK's call at the beginning of the hearing. Ironically, the same day that intelligence chiefs and a handful of senators criticized Snowden for endangering America, two Norwegian politicians nominated Snowden for a Nobel Peace Prize. To be called a "traitor" by Clapper, a proven liar, must translate in truth to "a real American hero." We ought to demand the positions of these killers, liars, and spiers be replaced by true patriots like Edward Snowden.